Rounding up fascinating news and research in the field of forensic science. In September 2001, when the US was still reeling from the notorious 9/11 terrorist attacks, two US Senators and various media organisations were sent letters containing spores from the bacterium Bacillus anthracis, the cause of the disease Anthrax. The malicious mail resulted in the deaths of five people, the infection of 17 others and an investigation between the FBI and the US Postal Inspection Service that spanned almost 7 years. Bacillus anthracis is a rod-like bacterium which can, upon entering the body, bring about the acute disease known as Anthrax. The endospores (spores) of the bacterium can lay dormant for years, but become activated and multiply after coming into contact with a host. Once contracted, the symptoms of the disease are dependent on the route by which the bacteria entered the body. However left untreated, the disease can ultimately kill the host. 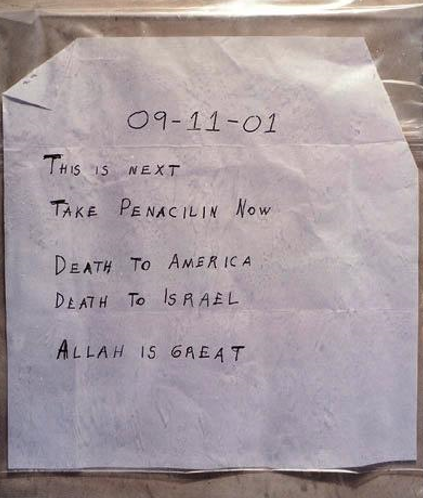 The mailed anthrax spores were accompanied by misleading letters suggesting the attack was motivated by religion, though the prospect of terrorist groups, that were already at the forefront of the country’s mind, were soon discounted. It was soon concluded that a likely source of the anthrax, which was of the Ames strain, had been maintained by the US Army Medical Research Institute of Infectious Diseases (USAMRIID). Suspicion fell on Dr Bruce Ivins, who had been a researcher at the facility. Whilst in this position, Ivins had created and maintained this particular spore-batch, suspected to have been the batch used in the anthrax attack. With suspicions supported by an array of incriminating circumstantial evidence, investigators called upon a team of scientific experts to establish whether there was a link between Ivins’ own anthrax and the mailed anthrax. Traditional forensic techniques were used in the examination of the spore powder and the letters and envelopes, including fingerprinting, and hair and fibre analysis, though this did not lead to any major breakthrough. A suite of analytical techniques was employed to ascertain various facts regarding the anthrax. Scanning electron microscopy (SEM) and transmission electron microscopy (TEM) were used to identify the size, shape and quality of the anthrax spores, as well as provide a profile of the chemical elements within the spores. SEM and TEM are microscopy techniques which employ a focused beam of electrons which interacts with the atoms of the sample, allowing it to be visualised. They can be coupled with energy-dispersive X-ray (EDX) spectroscopy to provide elemental analysis. The physical and chemical characteristics of the spores allowed investigators to presume that the anthrax was not weapons-grade, but it was of a concentration and quality similar to that used in bio-defence research. Inductively coupled plasma optical emission spectroscopy (ICP-OES), a technique based on the emission of photons from substances, was used to provide further details of the elemental composition of the spore powder. Furthermore, gas chromatography mass spectrometry (GC-MS) was employed to characterise the spores. Experts at the Center for Accelerator Mass Spectrometry (CAMS) were called upon to analyse the anthrax spores and establish their relative age. Accelerator mass spectrometry turns a sample, which has been converted into solid graphite by the analyst beforehand, into ions and accelerates these ions to high kinetic energies before conducting mass analysis to detect C14 (and potentially other isotopes depending on the work) to estimate the age of a sample. The analyses carried out on the samples in this instance determined that the mailed anthrax has been produced within 12 months of the attack, narrowing down the possible sources and suspects. But perhaps the biggest breakthrough in the case came from a newly developed DNA fingerprinting technique which allowed investigators to conclude that the blend of anthrax spores created by Ivins in the lab was identical to that used in the attack, though how unique this “genetic signature” was has been somewhat debated. The US Justice Department later concluded that Ivins was solely responsible for the preparation and mailing of the deadly spores, claiming that he believed the scare would resurrect his anthrax vaccine program. Ivins later died from an overdose, deemed to be a suicide. The case of Dr Ivins and the anthrax letters is a great example of how different analytical techniques can be drawn together to work in perfect harmony, utilising their individual powers to find out everything there is to know about a sample. In this case the array of techniques used allowed investigators to discover what the spores looked like and what they were composed of, their concentration and quality, and even how old they were. Armed with this information, investigators could home in on the source of the anthrax spores and the man behind the attack. Centre for Infectious Disease Research and Policy. FBI says it easily replicated anthrax used in attacks. US Department of Justice (2010). Amerithrax Investigative Summary. Darby, PA: DIANE Publishing.